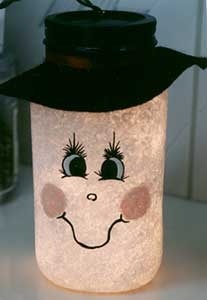 This sweet Mason Jar snowman Glow light would look great on a mantle or coffee table. He is made from a recycled mason jar and is just adorable. Recycling old items into new holiday decor is one of the fun parts of the holidays for me. See my alphabet block Christmas tree for another fun example of turning old items into new treasures. November 30 is Mason Jar Day. This cute project would be a great way to celebrate the day as well as giving you a new Christmas decoration to display. This project is shared from Craft at Home. Please visit the site for the tutorial.